Despite the strong performance of the US economy and its share market, the rest of the world is struggling to keep pace. US dollar strength has been a negative for emerging markets, while global economic growth appears to have slowed moderately. Although the signing of a trade deal between the US, Mexico and Canada has managed to settle some nerves, trade remains a key issue for investors. The US economy is powering along, and the September quarter is likely to see a repeat of June’s solid growth rate. The Atlanta Fed’s GDPNow estimate for the September quarter was sitting at an annualised 4.1% at the start of October, with consumer spending forecast to grow at 3.7%. However, there are concerns that tax cuts and the imposition of tariffs have led to some short-term effects, as manufacturers and purchasers ramp up inventory ahead of further possible tariff increases. A rising US dollar and slowing housing market activity may also be a handbrake on strong GDP growth. At its September meeting the Federal Reserve voted to hike for the third time in 2018, raising the funds rate by 25 basis points to a target range of 2.00–2.25%. 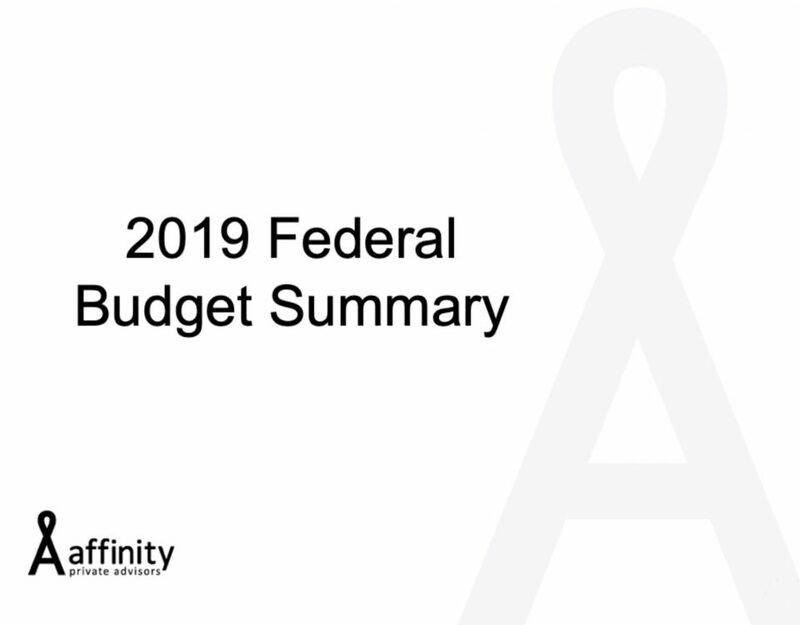 Based on a backdrop of strong jobs growth, as well as robust consumer spending and business investment, the increase came as no surprise to the market. The core PCE index—the Fed’s preferred inflation measure—is steady at 2.0% year-on-year. September’s non-farm payrolls release was below expectations, showing jobs growth of 134,000, but the unemployment rate is now at its lowest level since 1969. Focus remains on US-China trade relations, with the Trump administration imposing tariffs on US $200 billion of Chinese goods and threatening a further US $267 billion. Recent economic data across the EU has been relatively soft with Italian, French and Spanish CPIs all missing estimates, and Spain’s June quarter GDP revised lower. Growth across the eurozone was 0.4% in the June quarter and 2.1% over the year. GDP growth in Germany was 0.5% in the June quarter, up from 0.4%, buoyed by strong increases in consumer and government spending, while France, Italy and Spain saw subdued growth in private consumption. There is some evidence that the German economy is starting to rebalance, with most of the growth in GDP coming from government spending and retail demand on the back of rising wages. ECB President Mario Draghi backed up previous hawkish statements, describing eurozone inflation as “relatively vigorous”, although this was not entirely corroborated by September’s inflation release. While headline inflation rose in September from 2.0% to 2.1% year-on-year, core inflation was softer, falling from 1.0% to 0.9%. The Italian government spooked investors with a deficit target of 2.4% of GDP, which was significantly higher than the 1.6–1.9% previously indicated by Italy’s finance minister. In the UK, major party conferences were held in late September, with Labour’s Shadow Brexit Secretary stating, “Nobody is ruling out Remain as an option”, leaving open the possibility of Labour support for a second referendum. The news out of China has been mixed over the past month. The crackdown on credit growth in the shadow banking sector has been a significant factor behind the weakness in investment spending, although modest fiscal stimulus and easier liquidity conditions in the traditional banking market has supported growth. Stimulus may be needed to offset export growth, with the US imposing tariffs on US $200 billion of Chinese exports in September, which is estimated to wipe 0.5 percentage points off Chinese GDP growth. Perhaps as part of its negotiation tactics, the Trump administration has threatened to widen tariffs on a further US $267 billion of Chinese exports, effectively covering the entire US-China trade relationship. September’s official manufacturing PMI showed a fall from 51.3 to 50.8, while the private sector PMI dipped to a flat 50.0 reading, indicating no expansion. Industrial production growth was 6.1% while retail sales rose modestly to 9.0%. The easing in policy has contributed to lower market interest rates and a lower yuan. The currency has lost more than 9.0% against the surging US dollar since late March on the back of domestic easing measures, US Fed tightening, and concerns over a possible trade war with the US. Japan’s manufacturing PMI continued to expand in September, with output sustained by robust demand, although the expansion is slower compared to the first half of 2018. Meanwhile, Japan’s service economy grew at a very mild pace in September, with future business activity expectations broadly in line with the average for 2018. Core inflation in the Tokyo region rose modestly in September from 0.9% year-on-year to 1.0%—still out of reach of the Bank of Japan’s 2.0% target. In positive news, Japanese households increased spending by 2.8% in August—the fastest rate in three years—although spending remains constrained by low wage growth as companies opt to invest in factories and equipment rather than pay rises. Japan’s real GDP expanded at a 3.0% annualised pace in the June quarter, returning the economy to one of its longest recent expansion phases. Since mid-2011 the Japanese economy has expanded by around 14% in nominal terms—a good result for Japan but not even half that achieved by the US, UK and Australia over the same period. In India, the central bank decided to hold rates steady in early October, defying the market’s expectation that it would act to contain inflation caused by rising oil prices and a plummeting rupee. However, with core inflation running at close to 6%, a rate rise is likely on the way soon. The Australian economy continues to outpace expectations. For the first half of 2018, Australia’s GDP expanded at an annualised pace of 4.0%, challenging the US economy for the strongest rate of growth in the developed world. 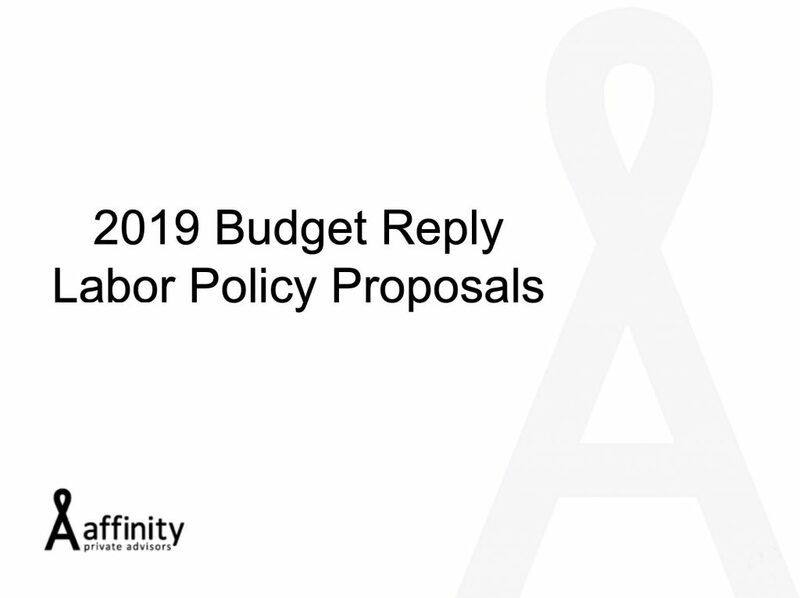 Recent growth outcomes are broadly in line with the RBA’s and Treasury’s optimistic projections, while the household sector has maintained solid consumer spending in the face of very subdued wage growth. However, while overall employment and hours worked have contributed to 4.6% growth in total labour ‘compensation’, the per head calculation was up only 1.6% over the year. In other words, wage growth remains anaemic and growth in overall income has been driven by population and employment growth. Employment rebounded strongly in August, with 44,000 seasonally adjusted jobs added in August, including gains in both full-time and part-time workers, allaying fears of a slowdown in employment growth. The data also showed a fall in the underemployment rate of 0.3 points to 8.1%, which while still relatively high in historical terms, indicates that Australia’s labour market remains in a tightening trend. Australia’s S&P/ASX 200 Index dropped 1.3% in September, with large cap shares bearing the brunt of the fall. The US S&P 500 Index returned 0.6% in September and the Dow Jones Industrial Average rose 2.0%, hitting a record high in early October. 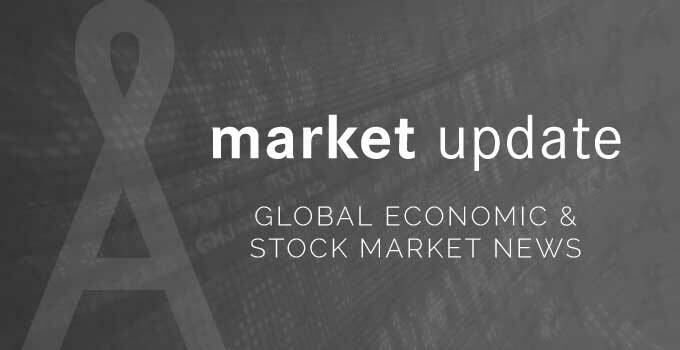 Europe’s broad STOXX Europe 600 Index was flat over the month, with the German DAX 30 Index falling 1.0% and the French CAC 40 Index rising 1.7%. In Asia, the striking of the USMCA trade deal saw Japan’s Nikkei 225 Index jump 6.2% while China’s CSI 300 Index rose 3.2%. Global developed market shares were flat in September while emerging market shares were down 0.6% in AUD terms. The S&P/ASX 200 Index returned -1.3% in September as the benchmark was dragged down by Financials (-2.2%) and the Health Care sector (-7.7%), including a major dip in pharmaceuticals giant CSL (-11.5%) which is coming off record highs following August’s earnings season. 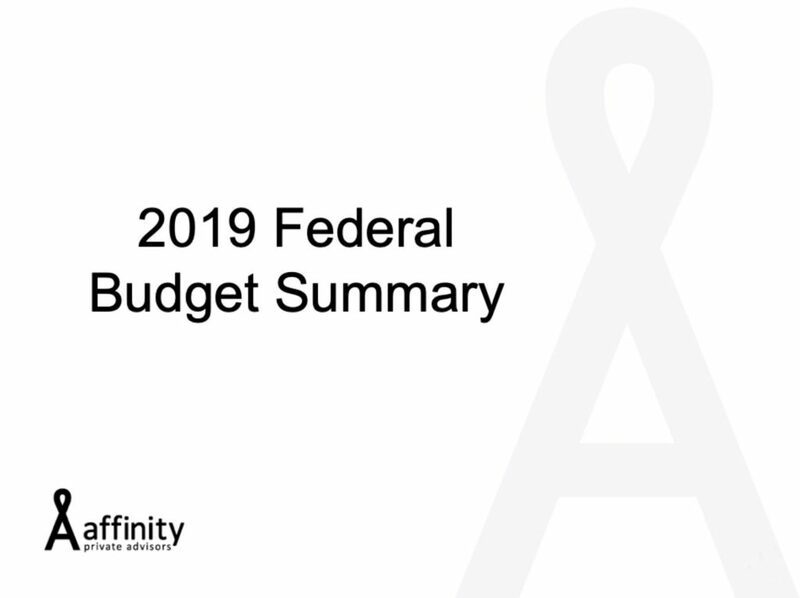 The Federal Government’s announcement of a royal commission into the aged care sector also impacted care providers Estia Health (-22.3%) and Fisher & Paykel Healthcare (-8.1%), which will begin engaging on the terms of reference of the inquiry. Meanwhile, the Royal Commission into Financial Services weighed on major insurance providers in September, with falls from Suncorp (-6.7%) and Insurance Australia Group (-5.2%). The Energy sector (+4.3%) was the top gainer in September, recovering from August’s falls, led by oil and gas explorer Beach Energy (+10.3%). Materials (+4.2%) also bounced back, with Rio Tinto (+8.3%) announcing a US$3.2 billion share buyback. In September the S&P/ASX 200 Communications Services Index was formed, merging telecommunications, media and online advertisers. 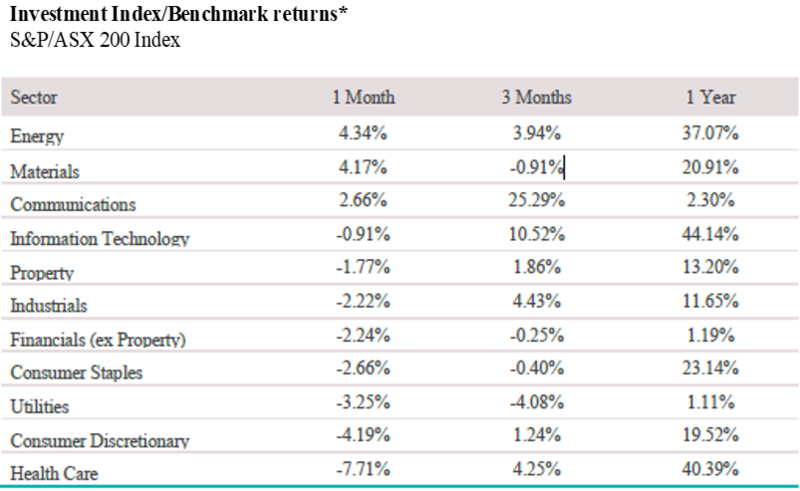 September performance was split across the new sector, with telcos Vocus Group (+15.1%) and Telstra Corporation (+2.9%) gaining, while Carsales.com (-6.7%) and Southern Cross Media Group (-6.7%) were the biggest losers. Divergence between developed and emerging market shares has been a key theme in global markets, and it is yet to be seen if September’s recovery in emerging market shares will be sustained. 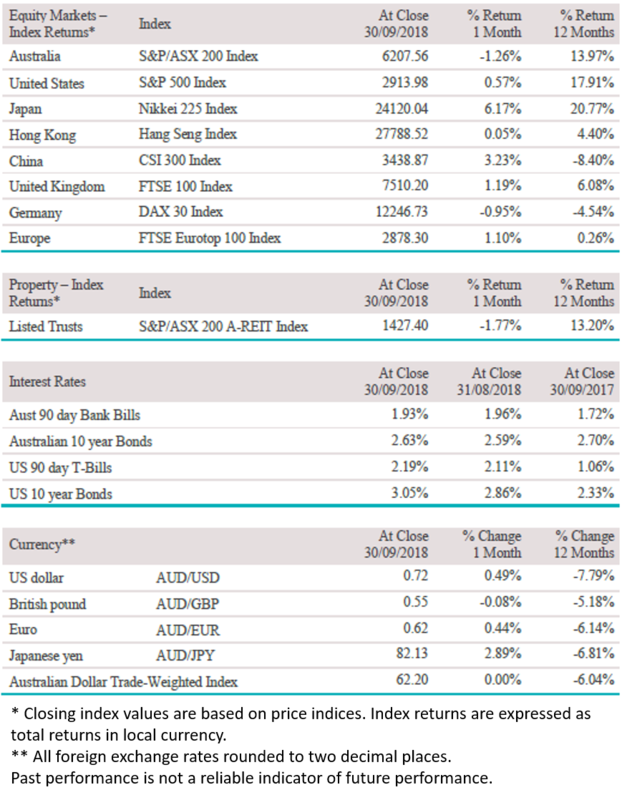 Global developed market shares, measured by the MSCI World Ex Australia Index, saw modest gains in local currency terms, bolstered by gains from the US and Japanese markets. The Dow Jones Industrial Index hit a record high in early October, pushing above 28,600 points, and the Japanese Nikkei 225 returned 6.2%, powering to a 27-year high following the final negotiation of a trade deal between the US, Mexico and Canada (USMCA). Leading the US sector returns was the newly created Communications sector (+4.3%), which was boosted by traditional media and telco stocks including Viacom (+15.3%) and AT&T (5.1%), while ‘new’ media stocks Twitter (-19.1%) and Facebook (-6.4%) were down. The MSCI Emerging Markets Index was down 0.6% in September in Australian dollar terms but rose 1.8% in US dollar terms. Emerging market equities recovered partially through September, with the Turkish market rising 16.3% in US dollar terms and the Argentinian index rising 7.0%. Selling in emerging market currencies showed signs of reversing in September, only to continue to slide through the start of October. The S&P/ASX 200 A-REIT Index returned -1.8% in September as rising yields brought the sector under pressure. Shopping centres tracked downwards, with Vicinity Centres (-5.4%) sliding through the month before announcing the selloff of 11 centres for $631 million, and Scentre Group (-3.4%) feeling the pinch as department stores battle falling revenue. Over the past year, the ASX 200 A-REIT Index has delivered broadly in line with the ASX 200 Index, and has outperformed Australian shares over five and seven years. While rising long-term bond yields are generally negative for REITs, especially those with higher leverage, the sector is proving relatively robust, indicating that investors are still looking for exposure to sustainable income and high-quality property. 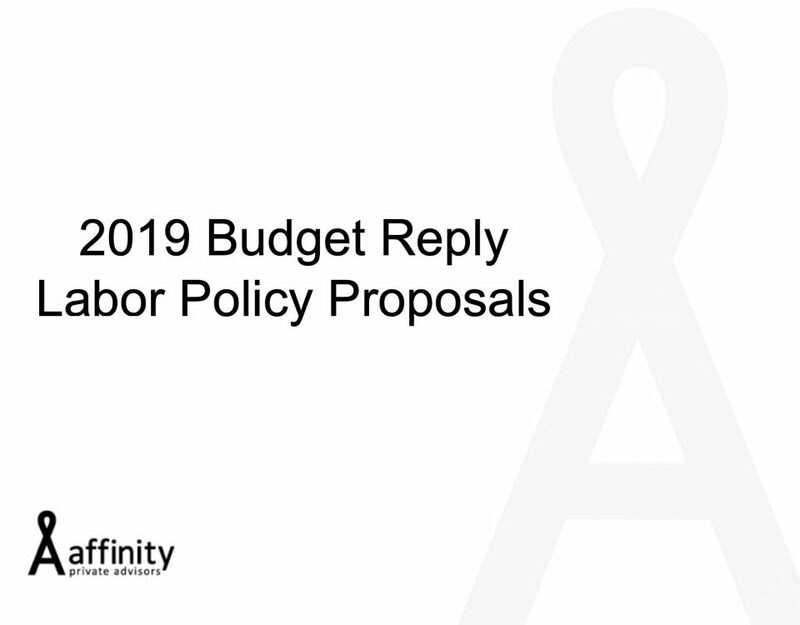 Labour’s plan to eliminate most cash refunds for excess franking credits may also result in a shift away from high-dividend paying and franked shares in preference of REITs and infrastructure. Globally, developed market property returned -1.8% on a hedged basis in September. US REITs hit a roadblock in September, with the Bloomberg US REIT Index down 3.1%, with falls in Health Care (-4.8%), Office (-4.3%) and Malls (-3.2%). Global bonds, measured by the Barclays Global Aggregate Index, returned -0.4% in September in AUD hedged terms as yields in both developed and emerging markets pushed higher. The US 10-year Treasury yield rose to a seven-year high in early October, pushing above 3.20% on the back of positive employment data, while markets focused on the potential for higher inflation and the impact of rising interest rates on equity markets. Following the Fed’s September rate hike, markets are still strongly anticipating a further increase in the funds rate in December, which would bring the target range to 2.25–2.50% by the end of 2018. Another three hikes are currently projected for 2019, which would move the funds rate above the ‘neutral’ rate. The Australian 10-year Treasury yield rose in September from 2.52% to 2.67%. The Australian dollar has been closely tracking the continued erosion of Australia’s interest rate spread, with the difference between the Australian 2-year Treasury yield moving just below 90 basis points in early October. Government yields in Turkey and Argentina, both of which have been on the front line of recent market turmoil, eased through September. The Australian dollar has been among the worst-performing G10 currencies in 2018, despite prices for key commodities including iron ore and coal proving resilient, notwithstanding a slowing Chinese economy. The Australian dollar has fallen by more than 11% since its February high, pushing against the 70 US cent threshold. A key factor to Australian dollar weakness is the widening spread between Australian and US interest rates, which may become more pronounced as the Fed continues to tighten. The information contained in this Market Update is current as at 12/10/2018 and is prepared by Lonsec Research Pty Ltd ABN 11 151 658 561 AFSL 421445 on behalf of National Australia Bank and its subsidiaries.